I am withdrawing from retail on December 31st. 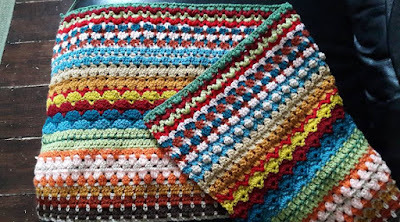 Companies like Lakeside Needlecraft, Charting Creations and Everything Cross Stitch, and Annie Millers will continue to sell my stock until then. When you copy or share someone's design, you are stealing more than their livelihood. A design comes from the heart; It starts as an idea, a concept. This is followed by sketches, scribbles and hastily written notes. We put that concept onto a computer program and our art because translated into pixels; squares of colours which turn an image in our mind into a rough cross stitch pattern. We work to smooth edges; to make a kraken in 12 squares or less, to add facial feature...s in a tiny group of flesh coloured squares. Finally, we colour check. We need daylight for this as we turn our threads into a palette; mixing, matching, finding tones which suit and which will show up on the fabric. I don't know about other designers but my floor becomes an artistic display of threads; matched, unmatched, all ready to either be put into the chart or in the pile of 'not this time'. Then we model stitch it our design; changing colours, altering the program, updating, updating, deleting, deleting. creating...until....GOT IT! It can take over a month for some designs to come out. And then we release them. 4 - 6 pounds for something which has taken hours and hours to produce. We don't work 9 till 5. This time of the year in Ireland, I can be up at 5 am, waiting for fresh daylight which will let me see colours clearly. If I am inspired, I can work until 1 or 2 am. And all of my designs are a part of me; my imagination; my inspiration, my baby, my characters. I am offering you are part of me. Other's didn't . That is why I am withdrawing all of my designs at the end of December. My heart was broken. I felt betrayed. Respect your craft, or you may find one day there is no craft to respect. However, we are not without hope. I have a new facebook group where EVERYONE is vetted. I will be offering competitions, raks and freebies AND I'm in talks with another company with potential SALs. I will also continue to use my work for fundraisers. 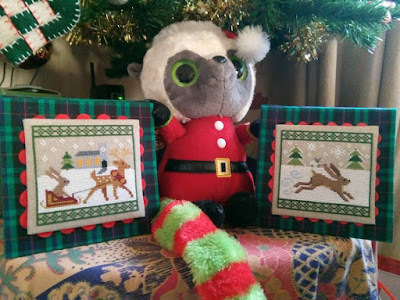 So far, since my design journey started, I have (with all your help) raised over 12 000 Euros for cancer charities, animal charities and palliative care charity. I know some of my neighbours criticise me. They think I'm too 'out there'. In the papers again! Well, you know what? I would walk through my town naked if it brought a cancer research charity some money. I put my money where my mouth is. I have raised a lot and will continue too with every day I have. Someone has shared their finishes of two of my favourite ornaments. 'Jingle Bells' and 'Dashing Thru the Snow'! Aren't they beautiful! Stitched by Amy Adams. 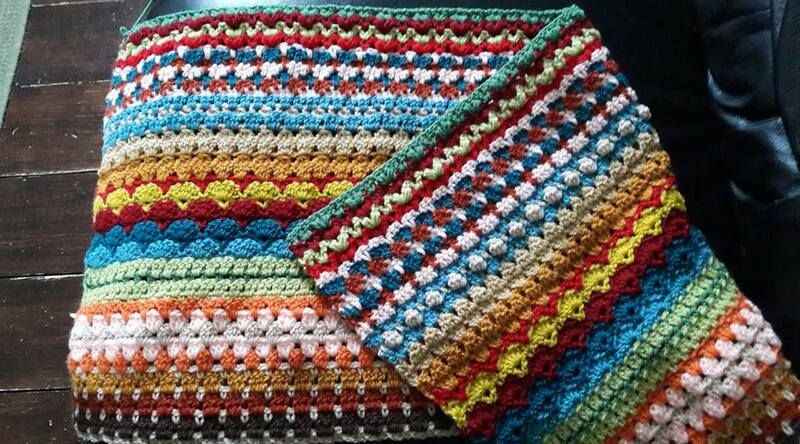 I'm hoping to finish my Spicier Life CAL before Christmas; sampling with crochet! Who would have thought it would be so much fun! 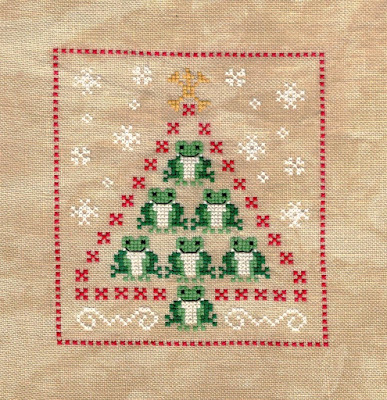 And don't forget, our little froggy Christmas Tree chart is available in the free chart section of this blog. Enjoy! Sorry to read this. It is too bad there are thieves out there to spoil it for you. How will we be able to follow you on Facebook? So saddened to read this but I totally understand where you're coming from. I love Amy's finishes, they're perfect. I am so very sorry that this has happened to you. Having once been a designer myself, I totally understand how your heart goes into each & every design you create. Many hugs to you. I second every word you say about copying and taking away from the people who are designers. Amy's stitching and finishing looks wonderful. Unfortunately I'm not on FB so I can't join. But I wish you luck with your new group. Such a lot of money you have raised for the charities you support - fabulous.